Nixie tubes (or cold cathode displays) are awesome and although the technology isn’t new (they hit the market back in 1955) they are making a strong comeback in the 21st century thanks to the maker community. 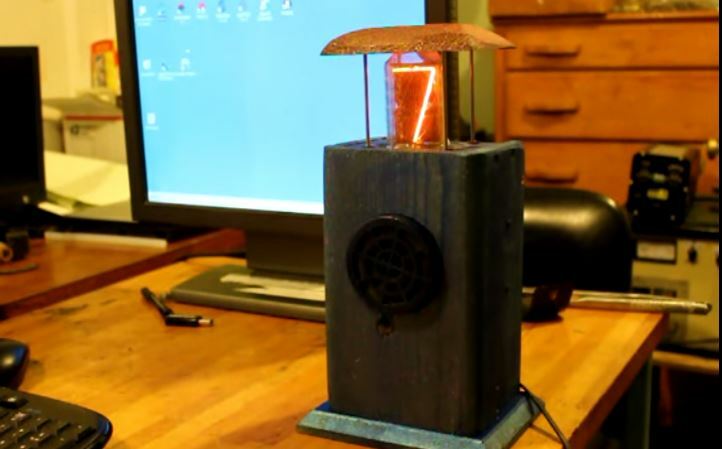 Ron Soyland has been making vacuum tubes for years and his love for Nixie tubes shows with his latest project Nixiepet, which is able to perform simple math tasks using interactive voice commands. His box-like pet, when called upon, raises from the top of the box exposing the giant Nixie tube displaying a zero. It can answer specific math questions such as adding, multiplying, subtracting and dividing multiple integers. The Nixiepet functions with the help of an Arduino Uno development board, which drives an EasyVR 2.0 speech recognition module for voice applications, a small motor/pulley setup that raises and lowers the carriage and the giant Nixie tube from Dalibor Farny. While it doesn’t function along the lines of R2-D2, it’s still a great project that certainly has a place on desktops everywhere.